Later this month, Stonyfield Farm and YoBaby Yogurt will be giving away 2,000 4-packs of YoBaby yogurt to their Facebook fans! 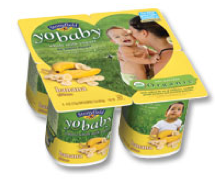 I have been using YoBaby and Stonyfield exclusively for our daughter since she was a baby. It is by far the better tasting yogurt. They’ll be sharing the details on their YoBaby Facebook page in the coming weeks, so make sure to “Like” Stoneyfield YoBaby on Facebook in order to get the news. I’ll also post an update when I find out the actual time and date.